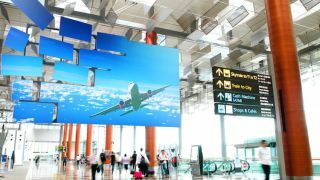 The What: Screen Innovations (SI) has introduced Tiles, a new screen-tiling system that aims to redefine the video wall category. The What Else: To build a Black Diamond video wall, panels are placed next to each other with a nearly invisible seam, and stacked in a running-bond pattern for superior strength. This is achieved by SI’s all-new, computer controlled cutting system, which is capable of cutting to extremely precise specifications. To ensure that the installation process is as time efficient and simple as possible, SI has designed a system that is 75 percent prefabricated; each panel then snaps into place with an attachment system that utilizes neodymium magnets. This installation process allows integrators to assemble a video wall of any size with ease, minimizing hassle on the job. All panels are precision cut and stocked in three sizes: 45, 50, and 55 inches for 16:9, and 43, 48, and 53 inches for 16:10. “What’s so revolutionary about this system is that there is now a solution for a massive ‘video-wall’ type screen without any of the headaches, installation problems, or budget concerns that give integrators nightmares,” Meek said. “Tiles require only a single light source, are a breeze to install, and are maintenance free (except for the occasional gentle dusting). And the technology is future-proofed with 8K+ resolution rating and UHD/HDR capability. The Bottom Line: Built with the Black Diamond screen technology, Tiles can go as large as 288 inches wide by 162 inches high (330 inches diagonal), and are 4K/8K+ rated and UHD/HDR ready.